According to the document, leaders of the two countries stressed that the newly-established comprehensive partnership will create more momentum for the bilateral multifaceted cooperation, focusing on politics, national defence-security, trade-investment, energy, education-social affairs, people-to-people exchange, and other spheres of shared concern, as well as collaboration within multilateral frameworks. They witnessed the signing of a memorandum of understanding (MoU) on the use of a hotline to deal with illegal, unreported, and unregulated (IUU) fishing between the Vietnamese Minister of Agriculture and Rural Development and the Brunei Minister of Primary Resources and Tourism. The two sides shared the view of the significance of maintaining all-level delegations, including the Joint Commission for Bilateral Cooperation, to seek collaboration opportunities for common interests, while further enhancing the partnership and trust between the two countries. They spoke of marked progress in defence affiliation and agreed to seek more specific cooperation opportunities between defence forces of the two countries, covering information sharing, the exchange of high-level official visits, and the establishment of consultation mechanisms. 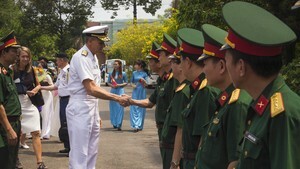 Both sides consented to closely coordinate and support each other at multilateral defence forums, particularly within the Association of Southeast Asian Nations (ASEAN), such as the ASEAN Defence Ministers’ Meeting (ADMM) and ADMM , as well as the ASEAN Chiefs of Defence Forces’ Meeting (ACDFM), and the ASEAN Regional Forum (ARF). They concurred to step up cooperation to facilitate and promote bilateral trade in a more balanced and sustainable manner, towards the target of US$500 million by 2025. They noted with pleasure the bilateral investment ties and reiterated their strong support for increased bilateral investment, especially in government procurement, public services, infrastructure development, fisheries, food processing, manufacturing, and energy. 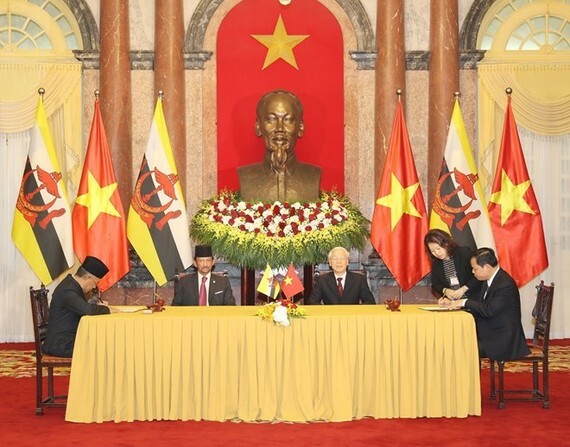 Both leaders hailed labour cooperation between the two countries, and directed the Vietnamese Ministry of Labour, Invalid, and Social Affairs and the Brunei Ministry of Home Affairs to enhance collaboration in the field for the benefits of both sides. They shared views on a line-up of regional and international, and reached a consensus on close coordination to handle global and regional challenges, including trans-national crimes, climate change, natural disasters, sustainable development, and food-water-energy security. They expressed their delight over the sound cooperation at regional and international forums, such as the ASEAN and its mechanisms, Asia-Pacific Economic Cooperation (APEC), Asia-Europe Meeting (ASEM), and the United Nations (UN). Vietnam thanked Brunei for endorsing the country to become a non-permanent member of the UN Security Council for the 2020-2021 tenure. Both leaders reaffirmed mutual support and close cooperation as the two countries are due to take on the rotary role of the ASEAN Chair in 2020 and 2021. They underlined support for open, transparent, inclusive, and rule-based regional architecture with ASEAN at centre. They also laid stress on the significance of maintaining and promoting peace, security, stability, safety, and freedom of navigation and overflight in the East Sea. Mutual trust must be enhanced among competent countries, while all disputes must be peacefully settled based on international law, including the 1982 United Nations Convention on the Law of the Sea (1982 UNCLOS). All parties need to demilitarise and exercise self-restraint when operating activities which could increase tensions in the East Sea, they said. They emphasised that they support the full and effective implementation of the Declaration on the Conduct of Parties in the East Sea (DOC), while welcoming advancements in ASEAN-China cooperation as well as in practical negotiations to finalise a code of conduct in the East Sea (COC). They committed cooperation towards maintaining an open, inclusive, and rule-based trade system, as well as completing a comprehensive Regional Comprehensive Economic Partnership (RCEP) that will secure benefits for related nations in 2019.